I’m quite proud of this latest creation and just had to share it with you. Her name is Kitson and she was born the 10th of January. And if things go quiet around here then you’ll know why. But it shouldn’t get too quiet, I was making quite a bit of stuff since I wasn’t working at my day job the last few months. And I have to say, my third trimester gave me the most creative ideas I’ve ever had. 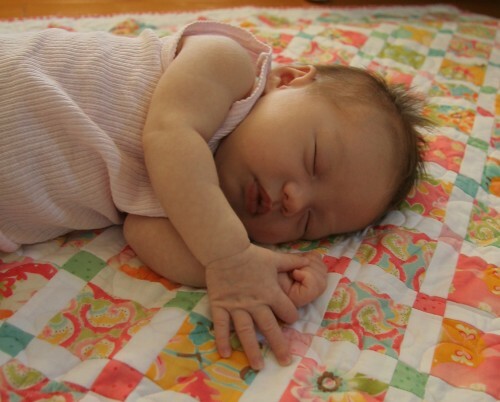 Forgot to say: By the way, the quilt in the background was made by my sister from Quilting Fairy. It took her about 3 days to make it and she blogged about it while doing so. She gave me some fabrics to choose from and she did the rest! She is beautiful! Congratulations! Hope you are all getting a little sleep – I remember those first few weeks as VERY tiring. Thank you Crafty Mummy. Yes, she is a lot of work but she is giving us some sleep time thankfully. I forgot to mention the quilt so I’ve added it in. I’ll pass on your compliment to my sister. what a beautiful sleeping baby. She just sets the quilt off beautifully also. hope you sleep when Kitson sleeps.